ROCK FEVER: The hemmed-in, claustrophobic, trapped feeling one gets when you spend too much time on an island. The natural impulse is to pack your bags, lock your door, throw out the keys, get on a plane and never look back. Then you remember you have pets to feed, marriage vows you committed to, a job, and other responsibilities. Reality can then feel like an ice cold shower. I am the ultimate sufferer of itchy feet (no, not the kind involving some sort of fungus) and I get downright depressed at least once a year when the feeling of confinement kicks in. Living la vida Island can sometimes feel very claustrophobic. The feeling of being stuck is enormous but I have made a startling realization: a tiny island may feel like the smallest playground ever but you never really run out of things to do. It just takes a little bit of imagination. Friends of ours have been inviting us for a while to go hiking but we always had an excuse not to tag along. I’m too hungover, I got to work, the dogs need me. You name it, we used it. Until one day I said “yes” and that forever changed my life. Hiking made me forget where I was and showed me places I never knew existed. So yes, take a hike on those days when your feet feel exceptionally itchy. Ok so, I am lucky, really lucky to be living on St. Maarten. There are about 6 islands close to us. So close in fact that I can see most of them on a clear day. There is St. Kitts and Nevis, Saba, St. Eustatius, St. Barth and Anguilla. Most of these islands are accessible by ferry while others are just a short plane ride away. Flights can be expensive at times, which can get frustrating, especially when you can see the damn island from your car window. But then there are those islands that are so close that you can easily visit for a day. 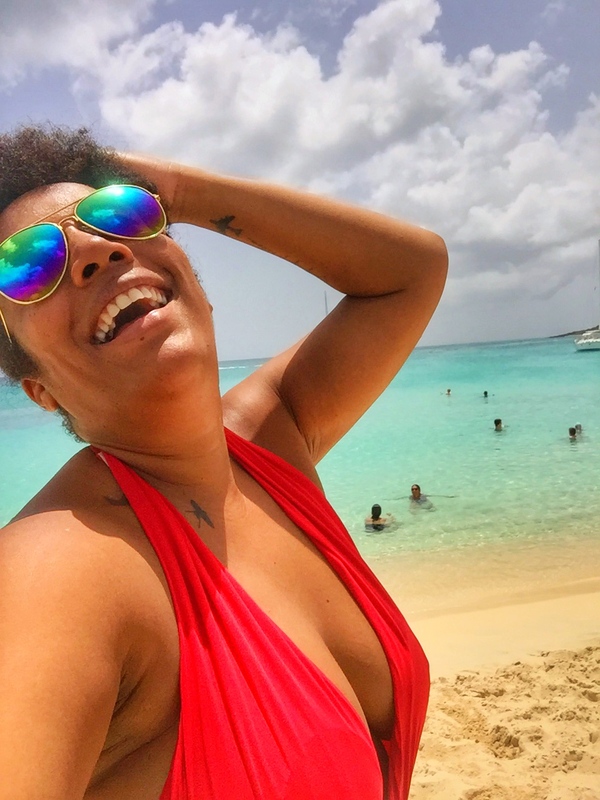 Check out my day trips to St. Barth and Anguilla and who can forget my recent 4-day relaxation vacation on Anguilla that I plastered all over social media? I am sure that like my place of residence there are quite some cool hotels around in your hometown as well. The great thing about hotels is that they tend to offer amazing specials in the off season, in an attempt to lure in the locals. Take advantage of their generosity and book yourself a nice weekend complete with swimming pool, beach lounges and room service. Living on an island makes us forget sometimes that what we take for granted everyday may be a major tourist attraction for others. So why not change your view and experience your home as a tourist? Do that tour that everyone has been talking about on Tripadvisor, or visit that most photographed beach or rent a couple of quads or dare jump out of a plane for a bird view of your hometown. The possibilities are really endless. If you are lucky enough to call a beach town or island your home you should definitely spend a day or two on the beach. The calming effects of the water are sure to calm the most serious of wanderlust cases. Since funds seem to be a bit low for all the travel I actually want to do I’ve decided to try new things this summer. I am going camping with a group of girls on a tiny uninhabited island that is part of St. Maarten. Should be fun. I have also gotten quite hooked on horseback riding ever since my first attempt on Anguilla recently. So add that to the fun things I can do here and the Sea Trek excursion is another one on my to-do list. What outdoor activities can you partake in in your hometown? Yes, I am adding this to the list even though it may not always be possible. But for the rare and glorious times that it is, you shouldn’t give it a second thought. Don’t think. Just book and go! It is the only real way to calm itchy feet. It is the explorer in all of us screaming for some attention.Travel keeps me sane and fuels my wanderlust. I check sites such as Cheapticket, Kayak, Google Flights and others on a daily basis in the hope of finding one of those awesome deals. But when you do, don’t overthink it and don’t come up with excuses. Just make it happen. In other words, readers: GO EXPLORE. Take another look at your surroundings, see the beauty in the everyday things you so take for granted. Visit tripadvisor and other tourist sites and see what foreigners seem to like the most about your hometown and go do or see those attractions. I can guarantee you that the outing alone makes you feel a bit less “Stuck”. So you see, Rock Fever is not a “thing”. It’s a state of mind and sometimes all you have to do is change your attitude. Get out of those imaginary shackles everyone. You are really not as “stuck” as you think.